Want to know the difference between rostered, rounded and authorised times? Need to see who is clocking in and out, and when? Take a look here. By default the review timesheet page shows all shifts requiring approval, and is divided into sections. To the far right are the available action buttons. Timesheets always show rostered details, but only show recorded details if the shift has been clocked into, and only show authorised details if the shift has been authorised. The shift times as on the published roster, before the shift was actually worked. Captured clocked in or out times, after any rounding rules set up have been applied, and any notes left by the staff when clocking out. More here on shift rounding. If the total recorded hours are different to what was rostered, the times are highlighted in red. If using the facial recognition option and the camera icon is green, the shifts have passed verification. If the camera icon is red, the facial recognition engine was unable to verify the identify of the staff member clocking in/out, either because captured image does not match the training images saved for therostered staff, or because there are no training images saved. The authorised times are what a manager has confirmed as valid, and include any adjustments made by that manager. When a shift is authorised, it is the authorised hours that will be included in any timesheet data exported from Ento for payroll purposes. 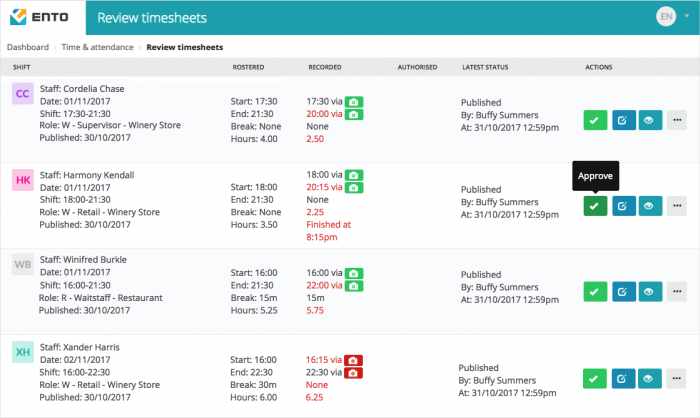 If you have managers in your account who only have access to ‘Pre-authorise’ timesheets in their Manager Permissions, this column will also display any pre-authorised times in italics, so that a higher manager can then quickly compare those to the rostered/recorded hours as required. The buttons to the far right include the Quick approve tick, the Edit and View buttons and the More button. Clicking on the ellipses icon will present options to use the Convert to leave and Zero out functions. By default only pending or unauthorised timesheet records will display. Use the search facility to filter shifts to display. A range of variables are available including staff, location worked, date range and more. Below these variables are the checkboxes to include timesheets with a variety of statuses. To view timesheets that have already been authorised or processed, check the Authorised and/or Processed checkboxes to include those records. Filtered timesheet records can be exported into CSV format using one or more of the Custom Shift Export templates. Edit or create additional export templates in Settings > Export templates. Take a walk through the timesheet review area in the training video below.